As has long been known in the field of undercover law enforcement, some information is easier to gather secretly than overtly. In late 2008, three psychiatric nurses had themselves admitted as “pseudopatients” to a Dutch psychiatric hospital. In collaboration with an acting coach and a psychotherapist, they developed fictive biographies for their characters–“back stories”–much as do undercover cops. One of the players was admitted to the psychiatric hospital by his “brother” after a suicide attempt that was part of his back story; a history of aggressiveness was also part of his backstopping. Family members, played by professional actors, came to visit them while they lived in the psychiatric hospital as a patient would. Following the lead of a famous covert investigation of the patient experience by David Rosenhan in 1973–“Being Sane in Insane Places”–these undercover investigators were trying to understand the conditions under which psychiatric patients experience their illnesses. Medical student Kristen Murphy living in a nursing home. Understanding the patient experience from the inside has become part of some medical schools’ training programs. 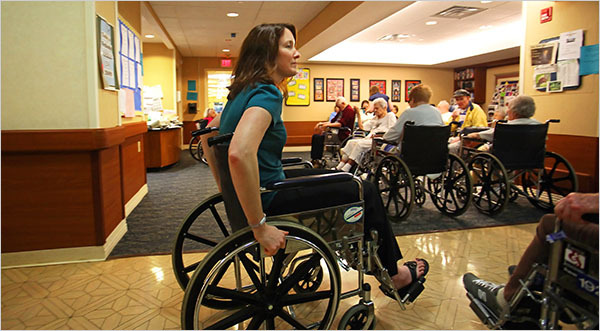 The University of New England medical school sent (young) medical students in geriatrics for two-week stints as “patients” in regional nursing homes where they could experience the anomie, the longing for human contact, and the challenge of navigating often insensitively designed environments: what their patients live every day. While it was of course impossible to be in any way in deep cover at 50 years younger than the target population, there was still much for participant-observers to learn. Shower bars, for example, were too high for people in wheelchairs. How far does a doctor have to go in feeling or experience to treat her patient effectively? And, practically, how close can a doctor get to experiencing what her patient feels without running the risk of being sucked into the morass of the patient’s suffering? Isn’t there also a peril of projecting her own experience of suffering upon her patient and blinding herself to the suffering that is truly the patient’s own? All this is at the middle of an ongoing debate in medical practice and training–at least in the places where patient experience is considered part of the clinical picture. Some say, just recognizing, identifying, being able to label the experience the patient is “presenting” is enough to treat an illness well. Others demand that, in addition to the awareness of the patient’s state, the health-care provider’s being able to respond in the moment, with real emotional savvy, is what constitutes true clinical empathy. They posit that, not only are so-called clinical outcomes better when doctors and nurses experience and convey clinical empathy, but their own satisfaction in their work rises when they allow themselves to be moved by patients. Some concerned with these issues have been using theatre training to improve physicians’ observational and receptive skills, helping them to listen for subtext, values, and strengths, and their performance skills, coaching them to express themselves fully and clearly through their voices and bodies and to use eye contact, breathing rhythms, and body positions to foster rapport with their patients. They distinguish between a surface-level and a “deep” acting, in which these skills have been internalized and become more automatic. Yet the bodies of others are not only relational and physical, they are also cultural, and there’s evidence that physicians who fold all these elements into a treatment plan see better outcomes. Just as in On Killing, the book featured in Skin in the Game’s January issue that examines the conditions that make it easier for soldiers to kill, it is harder for doctors to feel empathy for those whom they perceive as being different from themselves-whose bodies and selves they perceive as “other.” The next phase of development in the humanization of the medical professions so that they become professions of healing is the encompassing of how the perspective of someone one may initially perceive as foreign, other–and, thus, inevitably “less than”–can transform into a collaborative relationship of inquiry, with two body-selves linked in a common humanity. The Bodies of “Others”: Compassionate Care in the Health Professions will be presented at the American Holistic Nurses Association conference June 3 in Colorado Springs. Please contact Sara to schedule this workshop for your health-care organization. To subscribe to Skin in the Game’s monthly newsletter, send an email with “subscribe” in the subject line to sks@thinkingdr.com. To view past issues, click here. Sara K. Schneider, Ph.D., performance anthropologist, professor, and author, links public education about global cultures with the professional development of educators, health-care professionals, and clergy. Schneider completed her undergraduate education at Yale and trained at New York University in Performance Studies, the nexus of cross-cultural studies and arts theories and practices. Faculty and Program Co-Director in Interdisciplinary Studies at National-Louis University in Chicago, her three published books deal with the meanings of the body in expressive culture. Most recently, her workshop “The Bodies of ‘Others’: Compassionate Cross-Cultural Care” was presented as a pre-conference workshop for the American Holistic Nurses Association. Come visit Sara’s website, www.thinkingdr.com. Her newest book, Art of Darkness: Ingenious Performances by Undercover Operators, Con Men, and Others, is also featured at www.cuneiformbooks.com. She can be reached at sks@thinkingdr.com. Skin in the Game by Sara K. Schneider is licensed under a Creative Commons Attribution-Noncommercial-Share Alike 3.0 United States License. Based on a work at www.thinkingdr.com. Permissions beyond the scope of this license may be available from sks@thinkingdr.com. Body Culture in the U.S.